Teen Titans is a hyper-stylized, character-driven, American cartoon produced for Cartoon Network that covers the exploits of one version of the DC comics "super teen super team." The series lasted an impressive five seasons and sixty-five episodes. This team is led by Robin, the former ward of the legendary Batman. Robin leads Cyborg (an African-American cyborg with the real name of Vic Stone), Beast Boy (an always-green shapeshifter limited to animal forms), Starfire (a powerhouse alien princess with powers including flight and energy blasts), and Raven (an emotionally sterile empath with mystical powers) in a quest to save their home city of West Coast City. As the series progresses, new members are added to the team (enough to create a branch team, Titans East, and later a global organization) and recurring threats beyond a simple villain-of-the-week formula make themselves known. One notable addition to the team, Terra (a geokinetic able to manipulate earth, stone, and metal), proved to be an unstable girl used by Slade (see below) to defeat the Teen Titans from the inside out. The recurring antagonists of the show include Control Freak (an overweight teenager whose crimes and weapons are based on cult television shows), Overload (a malevolent circuit board capable of harnessing and controlling electronic and technological devices), Mumbo (a blue-skinned criminal with a stage magician motif and a magic hat that leads into an extradimensional space), Red X (voiced by the same actor as Robin, considered an evil counterpart of Robin and quite an adept tactician and fighter), and the Puppet King (a sentient marionette with a thing for capturing and replacing souls, he also has a sinister voice akin to Peter Lorre). The most menacing of them all, simply known as Slade (implied to be Slade Wilson, better known to comics fans as Deathstroke the Terminator) has been a constant threat to the Teen Titans, even from beyond the grave. Slade has an especially keen interest in corrupting Robin to his side. Not only does Slade possess impressive martial arts and weapons training, he later becomes a demonic thrall. The Titans make Robin give them a tour of Wayne Manor and discover how fun it is to be rich. The Titans are finally home, but a lot of things have changed. When Beast Boy sees Terra, he tries everything to make her remember. After hearing the words "thing change" from her, Beast Boy now has to face the fact that they change. The Titans traveled around the world one by one, to deliver T-walkie talkies to other members so they can defeat the Brotherhood of Evil. But I think this went the other way around. Returning to the origin of how the Teen Titans first met. Starfire, after being chased to Earth, meets up with the other future Titans to deal with her pursuers. Ding Dong Daddy has stole Robin's most prized possession. So what happens when other villains decide to try and get it? HIVE Five are now taking over the city, with the Titans all over the globe. So what happens when a new hero ruins the fun? Raven is stuck watching over 3 young heroes. She has to take them to a place where they would be safe. But what's with Mr. Mallah following them? The Titans meet a girl name Kole and her friend, Gnarck. When Dr. Light kidnaps Kole to use her as a crystal to become more powerful, can the Titans now stop a very powerful Dr. Light? In Russia there is a monster crazed for energy destroying parts of towns. All the blame is pinned on Red Star but is he really the one doing all the horrible things? Control Freak has the Ultimate Test for the Teen Titans, but it doesn't work against Titans East. So he comes up with challenges that Titans East can't beat. Have Titans East met their match? Robin has a plan to defeat the Brotherhood of Evil, but is he endangering every Titan around the world? Beast Boy is back with his team to try to stop the Brotherhood of Evil, once and for all. Beast Boy gets a call that the Doom Patrol is in trouble, so he and the Titans must take action and free Beast boy's "parents." After hearing the story form Robin, Raven now remembers. But when her friends are defeated, Trigon is in trouble now. Raven tries to keep the end of the world a secret from her friends. But can she do that? Mother Mae-Eye seemed to have came out of nowhere and into the Titans lives. After a bop on the head Starfire comes back to her senses. But can she also get her friends back to their sense? Cyborg wants to do more in his life. So when a chip is the exact answer to that. It may cause problems. After battling with a monster from space, the Titans' ship gets separated into five different sections. Will they get back together? The Titans are trying to find out what's the S mark on his head. Raven knows....but will she tell the others? Beast Boy wants a moped. But there's something pretty fishy about the place he works at. Robin is defeated by Katarou. Robin now decides to go to this True Master for training. But who's following him? Slade is now interested in Raven. But what's with the mark on his head? What does he want from Raven? Why does Raven hate a special day? With no way to recharge, Cyborg must find a way to go back to his own time while he is in a battle. The Titans must now stop Control Freak who is surfing channels and battling certain monsters he brings to life. When Control Freak breaks out of jail, recapturing him should be as easy as clicking a remote. But after CF hot-wires some high-end audio-visual equipment and escapes into a television, things get...a little weird. Can the Titans make their way through the wacky world of television to catch the channel-flipping bad guy? Teen Titans is currently available to watch and stream on . 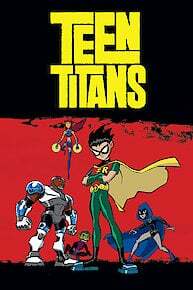 You can also buy, rent Teen Titans on demand at Amazon, Cartoon Network, Vudu, DC Universe, Google Play, DIRECTV NOW, iTunes online.